Senior Iranian officials this week accused the Obama administration of failing to uphold its end of the nuclear agreement, saying that the Islamic Republic has not been given full access to international banking tools. The Iranian leaders "lashed out" at the United States in their comments and maintained that the Islamic Republic continues to have many disagreements with the Obama administration, according to remarks published in the country's state-controlled media. 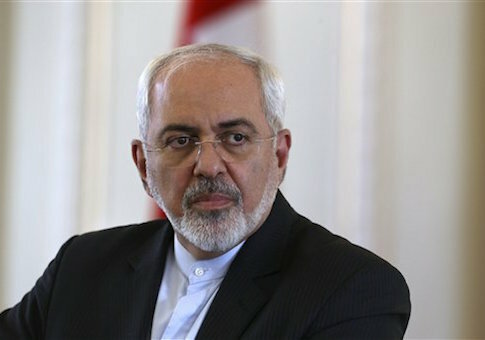 "Our differences with the U.S. have remained in place," Iranian Foreign Minister Javad Zarif, a key figure in the nuclear discussions, said Wednesday in front of reporters in Tehran. "They have not been resolved yet," Zarif added, explaining that the implementation of the nuclear deal has not soothed relations between Washington and Tehran. The comments come on the heels of an election in Iran that ushered in a large number of hard-line candidates who hold anti-American views. The Obama administration has declined to comment on the outcome. The speaker of Iran's parliament, Ali Larijani, also accused the U.S. of failing to uphold the nuclear agreement. "After the deal, Iran fully implemented its end of the bargain. Unfortunately, other parties are yet to fully commit themselves to the deal and reciprocate," Larijani said Wednesday during a meeting in Tehran with Romania's foreign minister. Larijani took aim at the United States and other Western governments for not moving quickly enough to grant Iran access to international banks and other markets. This "delayed compliance" by the West has prevented Iran from moving forward "with its policies and plans to normalize and expand economic, trade, and banking ties with its international partners," Larijani said, according to the state-controlled Fars News Agency. When asked to comment on the rhetoric, a State Department official told the Washington Free Beacon that Iran's comments are misleading and that the U.S. has upheld all of its responsibilities under the deal. "In exchange for the [International Atomic Energy Agency]-verified completion of Iran’s nuclear steps, we have taken all of the necessary steps to lift the nuclear-related sanctions we committed to lift on Implementation Day," the official said. Final vote tallies published following last Friday's election in Iran show that a large number of hard-line candidates won seats in Iran's parliament and on its powerful Assembly of Experts, which will install the next Ayatollah. Obama administration officials continue to tell reporters that they are reserving judgment until more is known about the election results. While regional experts do not expect the election to spark greater moderation in Tehran, those elected support the nuclear deal, particularly the $150 billion received in sanctions relief. "The recent elections solidify the support for the deal in the Islamic Republic. Even though the candidate field was rigged, the results were a clear signal that the majority of Iranians approve of the nuclear agreement and expect improvements to their economic situations from it," said Amir Toumaj, an Iran expert at the Foundation for Defense of Democracies. "The most prominent radical members of parliament who opposed the agreement and impeded President [Hassan] Rouhani’s economic policies were voted out, and the radicals who have seats in the next parliament generally support the deal," Tourmaj said. "The parliament results, however, are far from clear, as roughly 20 percent of seats will go to runoffs due in April. Rouhani can find a more cooperative parliament to pass his economic policies, though it wouldn’t necessarily be smooth sailing." Some U.S. lawmakers also expressed concern about the elections. "Until Iran stops being the world’s biggest state sponsor of terrorism, militarily propping up Assad the butcher in Syria, and spreading violence and instability throughout the Middle East, all this talk about ‘reformers’ taking hold in Tehran seems premature," Sen. Mark Kirk (R., Ill.), a vocal opponent of the Iranian regime, told the Free Beacon earlier this week. "What’s more, some newly-elected ‘reformers’ seem anything but moderate, such as Kazim Jalali, who called for the death penalty against leaders of the Green Movement in 2011."